Architects John Belle and John Beyer founded Beyer Blinder Belle Architects and Planners LLP in 1968. They have worked on many prominent projects over the years including the restoration of Grand Central Terminal, the Empire State Building lobby, and the Main Building of Ellis Island. They discuss renovating and working on landmark-designated buildings from the perspective of developers and clients. They also speak about working with the New York City Landmarks Preservation Commission, how standards have changed over the years, and public perception of renewal architecture. Q: Gentlemen, this is such an honor to speak with both of you. The New York Preservation Archive Project has interviewed many people in the advocacy end of things—the landmarks commissioners, community activists, historians, people who have been arguing a lot. But we really haven’t done much with the people who deal with the brick and mortar, who actually make preservation happen and make the necessary decisions on how to balance finance, clients’ interests, the concept of preservation. So, we’re really delighted that the two of you have agreed to speak to us. You got started in 1968 as the firm, and the influence of Jane Jacobs and her book The Death and Life of Great American Cities. Did you have any idea that you were going to become the major firm for historic preservation in New York or did that just happen? Belle: There’s a lot of ground to be covered. Catching up with preservation restoration with existing buildings maybe hadn’t been given their due in history and their position in the urban environment in the way it should be. But you can’t go too far in that direction because there really needs to be a further understanding of what causes adaptive reuse, what causes historic preservation. As time progress and as one generation’s views the use or reuse of existing history is a different point of view from the previous one. Q: Well, you’ve seen major changes. The approach and idea of historic preservation in 1968 is very new. The [New York City] Landmarks [Preservation] Commission is all of three years old at the time. You must have watched this evolution of ideas about historic preservation, its place in the city, evolve. Has your own thinking evolved? How has it evolved about preservation and adaptive reuse over the last half century? Beyer: Speaking of Jane Jacobs, who was very influential. She, with her community group, was one of our first clients in 1968 or ’69. Q: The [Manhattan] Community Board [No. 2] in Greenwich Village? Beyer: The Community Board, too. She was a significant force among many others whom we retain a fairly close relationship with. She asked us to help them in planning their waterfront. We had founded the firm on the principle of planning, rehabilitation and the sensitive design of new buildings in historic places. Those foundations seemed to appeal to the community group that hired us to look at their waterfront. I lived in the Village, John lived in the Village at the same time, and that didn’t hurt in the selection process. It got us going in a direction that has never changed. Our philosophy in that moment of our genesis is unchanged today. We have a nice firm of people who also believe in the same thing. Q: The Greenwich Village waterfront is an interesting subject. There was a push to have an actual historic district there. It took a long, long time. Greenwich Village itself early on. When you and the Community Board and Jane Jacobs were discussing things like what makes for a lively urban neighborhood, how do things work in terms of humanity dealing with the physical space—how did historic preservation come into it, if it did specifically? Belle: Well, I think it seemed to us to be a logical extension of the philosophy that a building was worth saving for many reasons, not the least of which was its historic influence within the community but also its usefulness as a part of the urban fabric, whose use might change but still had to adhere to the principles of development and restoration that would make it a compatible neighbor with those adjacent buildings and not a competing neighbor. Q: Did you find much antagonism to this idea? It was a fairly new idea in 1968. Beyer: In general, the profession thought we were crazy. Q: To not put too fine a point on it. Beyer: The profession came to preservation very, very slowly. I would say that in 1968, we were one of a very few seriously involved and reasonably well-educated architects dedicated to renewing not just buildings but slums. All of our first projects were rehabilitation of tenements in the Bronx, Manhattan and Brooklyn. We brought a new level of professionalism and philosophy of architecture to what was always thought of as a very secondary aspect of architecture. I think we were recognized early for that by mostly non-architects, by people such as those who perhaps you have interviewed, people involved in the process of preservation. Since then, we have had many fine architects, and certainly almost all of the younger architects, fully understanding and devoted to the subject. In fifty years, that’s not too bad a record. Q: That’s an enormous change. Do you remember the ah-hah moments when you saw the people shifting, when a light went on that said, oh, that could be interesting—bringing historic preservation into otherwise a development project? Beyer: That’s a good one. I think the key thing, of course, was Penn [Pennsylvania] Station. That’s what made everything come around. That was later, but Penn Station came first, then Grand Central [Terminal] [GCT] second. In 1965, the law was enacted, we came in ‘68 and it took until nineteen—when did we start Grand Central John? Belle: That’s when it began, it went on until 1993. Ten years. Beyer: To have the whole testing of the law and all of the things that made it possible to restore Grand Central. They were paralyzed because they couldn’t move without having the whole preservation laws tested. The ownership of Penn Station being relieved of any threat of an investment not being contested or an investment proven to not be worth anything. As soon as that was determined, the whole Grand Central thing took off. John might be the one to talk a bit more about Grand Central. Belle: Well, Grand Central had the uniqueness that it was a major landmark building—it was part of New York’s fabric. Everyone agreed with its historic significance. What was not necessarily agreed to was what had to be done to save it and find acceptable new uses for an old building. That did take time because the major components of reusing a building are finding viable usage for its future use. That’s tough to do for a railway station when railroads are running themselves into the ground. But there were a few long-range thinkers who thought they could make the case for Grand Central’s future use as a transportation-associated facility. That’s what got it going. The other issue was the discovery of a very significant archive of historic fabric drawings that helped push the GCT up [unclear] further on [unclear]. The next thing was to find out how viable was the test that the building was of historic significance, if it was worth saving. That of course took every part of it. In the designation of the building as a historic landmark, not necessarily in actuality but in architectural content and substance of historic fabric. I could go on and on. Q: There were two, that I know of, decisions that you had to make that I’m really curious to know about. One was the addition of the staircase on the east side that mirrors the Vanderbilt Avenue stairs that were never there but were in the plans and you decided to put in, which I gather was a somewhat controversial idea at the time. Beyer: It was exceedingly controversial, to the extent that there was a war between the New York City Landmarks Commission and the state—SHPO [New York State Historic Preservation Office] that had to be resolved in Washington by a special committee, I forget the name of that committee—that heard similar controversies and made a judgment about what to do. We, in the Landmarks Commission in New York, preferred to do something that was sensitive to the historic fabric of the building, subtly contemporary but not aggressively so. So that when you looked at it, it fit in but if you studied it you could see was contemporary and new, not built in the original time of the building. The state, going along with the more inflexible guidelines of the secretary, wanted something totally contemporary, and recognizably contemporary, which is a philosophy we often pursue on many projects, particularly when you can justify the modern style and look from a total point of view as opposed to just being an isolated subject. We felt that in this case we would not do that. We felt it would be inappropriate and confusing. It would call too much attention to itself because it was so modern. One of the things we tried to do was subtly intervene when it’s a sensitive condition as opposed to being aggressive and waving our own flag over what we’ve just done. That was an argument that could not be resolved without the secretary’s special committee deciding, in our favor, to do something more subtly contemporary. Belle: There’s another important player in that unlike so many other historic review purposes that go through this multiple phase with the support of the state SHPO and the city’s historic preservation department, this project went through the review process only with the State Historic Preservation, SHPO. That was quite a bold move for the state to take that up as a cause. In fact, that caused a lot of disagreement. It wasn’t coincidence that one of the key members of the State Historic Preservation Office was also a major supporter as a member of the citizen’s committee—what’s it called? Which was appointed by the Landmarks Commission—led by a very strong supporter of Grand Central, Joan [K.] Davidson. Beyer: It was a cause célèbre. Q: What aspects of the design of that new staircase, in you minds, are cues that it’s contemporary? Beyer: The detail—the detailing of the handrails, the balustrade, and the way by which it has a geometrically simplified form. Belle: It can be recognized but not accused of replication. Beyer: Some people thought it was too subtle, and some thought it wasn’t historically correct, which we feel sort of proud about because the one thing we wouldn’t want it to be was historically correct because it wasn’t historic. That would be a big mistake. That would be a fake copy. Beyer: His name [Paul César] Helleu. Q: Well, Helleu sketched the original. But in the ‘40s, they brought back the fellow who had actually worked with the two Americans who executed it. So, you had to make a determination: Do we go back to the original 1913 ceiling or do we do this 1940s replica? How did that work? Belle: It was a very painful process because there were a lot of honorable people who were passionate about their version of which restoration was preferable. There were a lot of people who were not so intent but used the process to manipulate, but fortunately they didn’t win out. I think, for once, the Landmarks Commission, the State Historic Preservation Officer and the client, don’t forget the client was a public authority, MTA [Metropolitan Transportation Authority]. Q: You were dealing with Peter Stengel? Beyer: He was the wonder of the project. He made that project happen. Q: That was the impression that I had. Belle: It’s a wonderful example of one man being able to make a difference. Q: You’ve worked on the South Street Seaport? Beyer: That’s how we got to know Jimmy [James Marston] Fitch. Beyer: It’s the case of the purloined building, which Jim Fitch wrote an article about and had published. You’re on to a very important, loving subject for us. Beyer: I saw that, it was a recent piece, right? [Crosstalk]. But there was another recent one. Q: But you rebuilt that, it has a different name—the Cannon’s Walk—when you go down on the left. There’s that metallic front that’s supposed to, not a recreation, but is supposed to symbolize, because one of the plans for the Bogardus Building had it been able to be re-erected was to move it to the South Street Seaport. There were arguments about that, and in the meantime the building’s parts disappeared. So, somewhere the decision was made to do what you did. Beyer: Let’s talk about that, because Jim Fitch was very involved in that. He was then a member of the firm. We knew him, he actually lived in my building, but when he retired from Columbia [University] he joined us, happily for us. And I think he was extremely happy with that. Probably the first significant project with him was that. Q: The second was a theft? I heard they were simply thrown out as a bunch of rusting old pieces of metal. A; You know, I don’t know that. We were just so distressed by what happened that I don’t know exactly how it happened, but it happened. So, then we decided we had to design a new building that had some reference to the fact that we were going to put them there, not the fact that they were there. Keep in mind that the building we were designing was surrounding an airshaft for the subway, the IND Subway [Independent Subway System], that remains a significant three-dimensional object ventilating the deep tunnel for the IND subway that was built in the ‘30s, or something. What was there was gone by fifty or sixty years. We came to the decision that the new building should be a reference to the Laing Stores. Now, that is a controversial reason. Why did we select that, there were never there? But we didn’t think it was appropriate to try to recreate some kind of version of a brick building that was there. We felt that there was a strong enough architectural idea that failed because of the pieces that were lost and couldn’t be recreated there. We felt there was a good reason to make something that was quite contemporary, particularly since the building across the street that Ben [Benjamin C.] Thompson was designing was a contemporary building, and we were surrounded by many, outside the district, contemporary buildings. We got a very strong direction from Jim Fitch on this idea. So, that was our first real collaboration with Jim. Q: What was his interest? What did he want to see happen? Beyer: Not a recreation, or even a simulation of a brick building that may have been there. Belle: When it came down to it, I think he was pretty satisfied with it. It had to be a contemporary-style building. A building that had a cast iron front was in keeping with that philosophy. And it came down to two different types of design—a brick, masonry style and the other was a cast iron, steel facade. Beyer: It was painted steel because of the size of it. But the interesting thing was we received a lot of accolades and good reviews from the press, but I think there were people in the academic world who disagreed with the philosophy. Q: What would they have preferred to see? Beyer: It was an arbitrary reason for the style of the building. Q: In other words, you shouldn’t have done anything? Beyer: No, it’s just our selection of the style was based on, in their minds, weak grounds. That because something was going to go there that was never there but was lost wasn’t justification to do something that was inspired by the lost fabric. Q: Did anybody suggest putting up a plaque that explained what it was with a picture of the Laing Stores? Beyer: We tried. That was dealing with the Rouse Company at the time and they had other ideas about signage. Q: So you would have done it, but they said no? Q: I’m so glad to hear that because I take walking tours there and I explain the story and get, “Oh, that’s why it’s here?” For people who don’t know the story, it’s mystifying. Beyer: It’s a good point. Maybe some day that could happen. I actually forgot about it. Maybe the Rouse Company is less interested in what’s happening upland now that they’re doing—first of all, the Rouse Company is gone. So the successor group might want to. That’s a great point, I hadn’t thought about that. We should get together and lobby to make that happen. Q: To me, the most interesting things about your projects are the ones where you come in as architects and not just straight historic preservation advocates and say, what can we do to make a living project work? The [René J.] Lalique Glass by Henri Bendel is another example. There’s a historic artifact, the Lalique Glass, in a building that’s about to disappear because of tower that’s about to go about. It was a huge preservation battle. The comprise was to push the tower back by fify feet so that some of the structure still survived as an armature for the glass. And I think also the Rizzoli Building next door. Q: Well, an atrium, that’s right. You walk up the stairs and you can go see the glass. How did that evolve? Beyer: Andrew [S.] Dolkart, who we all know so well and respect enormously, discovered the glass—I don’t know how he found out—during the process of the design of the new building. We never really found out exactly how he found out, but as soon as he found it, in the middle of what was the design of a very major building—KPF [Kohn Pedersen Fox Associates] was the architect, [unclear] organization was developing it. He went to the Landmarks Commission and they intervened in the DOB, [New York City] Department of Buildings process because of the uniqueness of the Lalique glass. Probably the only example, or significant architectural example of Lalique glass in New York. Beyer: Maybe the country. That’s where the controversy started, because what was happening to the developer was a takeaway. He had building plans approved, he was ready to build, there was no landmark issue. The establishment of a landmark designation during the construction, after approval from the Department of Buildings, was inflammatory. But I think the key thing was that the developers agreed with it, they understood it, and they felt that they could live with it. At least to what I understand about it. Maybe internally or behind the scenes, naturally there would be a takeaway because the tower was reduced in size. That went quickly. It wasn’t a long process; it was a very rapid-fire procedure. We had worked with Les [Leslie H.] Wexner at The Limited Company on a number of projects. So we were brought in immediately by him. Q: You were brought in once it became a historic preservation issue? Beyer: Yes, we weren’t involved before because it wasn’t intended to be retained. Then it was just a question of how you take care of a building that’s a wood-framed structure with wall-bearing masonry attached to a tower with a façade that had to be completely kept—correctly so—restored, supported and done in a way the glass would read. So that it wasn’t just an atrium. We had the balcony surround the entrance so people could go up and almost touch the glass. Q: That’s why the balconies are there? The balconies are there so people can go up and see the glass? Beyer: Yes. That was part of the design and immediately supported and agreed to by Landmarks. It became probably the featured photo-op for the retail store. How many people do that—I don’t know. There is a story about that. And because of the way that was approved, every couple of years there’s a full inspection of everything about that glass. We do that for the Bendels. Q: You inspect its condition? Beyer: Yes, the building next door to the south, was not designated. Q: Are you sure? I thought they both were. Beyer: No, that’s a new building that we designed. Q: I must be thinking of something else. OK.
Beyer: Another example of a subtle—take a look at the detailing of that building—a subtle interpretation of the vocabulary of that block front mostly inspired by the Lalique glass building: very squared-off or rounded balustrades, simple, unarticulated, modern detailing of limestone, no real corners but a simple cantilevered stone projection. We were also thought of as being either too subtle or not sufficiently modern. We felt a replication would be wrong, and doing something so radical would take away from the glass. The key things for us was keeping the glass, the Lalique glass the feature of the ensemble, not having two features but one. It’s a very simple background building. Q: The restored lobby of the Empire State Building was the ceiling a recreation or was that a restoration? The painting on the ceiling of the lobby? Q: There was enough there to work with? Beyer: Yes, well a restoration in the sense that it came from archival research and the materials being there. It wasn’t an interpretation, by any means. Why don’t we talk about Jeff Greene a little bit? Q: Who is Jeff Greene? Q: Is this Greene [EverGreene Painting] Studios? Beyer: Greene Studios. Either a perfect replication of something lost, an excellent restoration of something almost lost, or a completely new version of how you might paint something, because that’s the design. He’s a painter with an incredible artistic ability. Belle: The knowledge, or familiarity, of his style of painting that we know is Trompe-l’œil, more than any other style of art, is a great influence on how the architecture is expressed. Everything that was determined in the stone masonry detail is actually carried out and executed in paint. Beyer: It’s a great European tradition, to make stucco look like stone. Belle: Which leads us to the wedding room. Beyer: Yes, [unclear]. The ceiling of the Temple Emanu-El is a very subtle restoration of color. You may not have seen it, but it’s one of my favorite restoration projects in New York. It’s a transitional stylistic building, kind of Deco-Classical-Byzantine [crosstalk], and Jeff did the ceiling. Belle: It’s really magnificent. A piece of art. Beyer: Painting is still a very lively art. Q: We should talk about James Marston Fitch. How did that happen, that he came to your firm? And what impact did he have one your firm? Beyer: How did we snag Jimmy is the question. Belle: I have lots of stories about that. Beyer: The first thing was we knew him professionally. We didn’t know about the Columbia retirement age, I’m not sure how that came—where you the one that heard about it? Belle: I don’t know, but basically, he couldn’t get a pension in any other way. Beyer: But he was surprised by our offer, and we were totally amazed by his acceptance. It was a plan made in heaven. Beyer: Well, because we had emerged after getting to know the Bronx, and Harlem and many other parts of our town really well through our rehabilitation projects—we had emerged in a new way, mostly through the Seaport, as taking rehabilitation to a more preservation-level step. Who in the world would be more appropriate to help us do that than Jim Fitch? So, we made the offer and he accepted quickly. We have never ever had a more important influence on the firm. He was to us like what he was to the students he had, and you being one of them can testify to this—the authority, the person you would never forget, the person who would really influence you, either because of your education, or in our case, because of our education. We worked together for twenty years. Q: How did he influence what you did? Beyer: Because he was so powerful, we had no choice. Q: Are there specific things that stand out where you would have gone this way but with his influence you went that way? Belle: Speaking for myself, as a young architect in London becoming familiar with the historic role of the new architecture style into actual style, Jim was a tremendous and significant influence on a lot of the young architects who were groping and finding their way out of the morass of World War II. It would give some sense of direction for architecture. He was friends with all of the left-wing architects in London when he and his wife came to London on a sabbatical. Q: What year would that have been? Belle: I guess ’52, or something like that. He was one of the school of top architectural critics who linked the cause of social improvement to architectural design. It was a very compatible, joint marriage between Jim and the leaders of that social movement, long before it became a community-wide function. There’s a story that I’ve never been able to authenticate but I believe probably some version of it is true. In the ‘50s, when McCarthyism started to own the scene here in New York, Jim and Cleo [Rickman Fitch], very depressed, set off for a new life in London. They had a big farewell party, they loaded the books, into one of the places on the ship, got onboard the ship, their friends said farewell thinking it was the end of their life, particularly their social life, in New York, set off for Southampton. On the way, they learned that [Joseph R.] McCarthy was no longer and immediately turned around and came back. He was never to go back in that capacity again. He was so happy to be back in New York. I don’t know how true that story is but I’ve heard it a number of times. Beyer: That’s a great story, the first time I’ve ever heard it. Q: So how did he work on—[crosstalk]. Belle: There are several sensational stories about Jim Fitch, things linking social progress of architectural design. He hated Margaret [H.] Thatcher, absolutely hated her. I set off a [unclear] in a three-state visit to the area here, I set off for a site visit with Jim in the car with me. By the time we’d gone to the Bronx, no further, he was already ranting and raving about Margaret Thatcher or somebody like that. That spirit really helped the young architects find direction and make a linkage between what they hoped was happening and what could happen. Really active, viable. Social movement for art. Q: He wasn’t an architect himself? Beyer: He was [crosstalk]. He was trained as an architect and worked as an architect for a firm when he finished at Tulane [University], but never practiced after that. He went into writing and then into teaching. Belle: He designed two houses for himself. Q: How was he involved in Grand Central, for instance? How did that work? Beyer: Basically, his role in the firm was an inspirer, a critic and a reviewer. He didn’t execute things, he conceptualized things, and made sure that we followed up. That sometimes created some fireworks because we would get a general direction from Jim and sometimes it was difficult to execute it exactly like he wanted it—for reasons that could do with technology and client problems or practical problems, cost problems, whatever. Sometimes he was unhappy about that. But he was very, very constructive. Even when he was unhappy, he was constructive. Belle: Sometimes he was just unhappy about not being included. Beyer: Yes. We did include him, we couldn’t keep him out [laughing], not that we tried. Q: You mention fireworks, is there any particular project that comes to mind? Belle: Ellis and Grand Central had pieces of them, but nothing like he expected. Beyer: I would say they were mostly dealing with the execution of some of the work—maybe not being correctly restored. Although he brought with him some very skilled people when he came to the firm and established a preservation group that ultimately became with John’s leadership one of the most important parts of our practice. And for many people, particularly the outside world, the only part of the practice that people know about is what we do in preservation. Q: Well, it’s very high profile. Let me ask you, taking a different direction, have your clients’ attitudes towards what you do changed over time? They come to you because of your preservation background, but doing something in 2010 in very different than doing something in 1970. How has that evolved? Beyer: A couple of thoughts come to mind, I’m sure John will have his own. Number one, there are two or three parts to a client definition. The institutional clients, of which we had many, have always been involved in preservation because many of them own historic buildings and are used to it. The world of universities, museums and government has always been involved with preservation and in many ways have certainly done it before us or Jimmy or anybody, contemporaries, very well. There were groups of preservation architects that did that work. On the developer side, where there would be a corporate builder of buildings—office buildings, residential developer, retail, hotels—I would say in general, except probably for hotels, which there was always a cache about historic hotels, preservation was not on the top of their list as something they wanted to do. It was something they had to just deal with if they owned the building and would probably stay away from it if they could. That has seen a huge change, maybe in not only attitude but just simply because in New York, particularly, the large number of buildings that are constantly turning over and the designated landmarks, they need to be cared for because they are protected. There are fewer sites to build new buildings. People are looking to renewal building much more than they did. Q: Out of necessity or out of conviction? Beyer: I think necessity. I think probably the necessity part blooms larger than the love. Although we do have clients that do nothing more than develop historic buildings. Belle: Well, look at the explosion of small, well-designed hotels in SoHo in the last five years, or maybe less. It’s quite noticeable and it’s there because these types of unique buildings with good sunlight and good detailing, things like that, came into its own rather than the more barren hotels in the chains. It’s good financial justification for it as well. Q: You’ve had a long experience with the Landmarks Preservation Commission, from the beginnings? Beyer: Pretty much since the ‘70s. Q: How would you characterize what that’s like and how has it evolved? Beyer: Maybe, you want to try that one? Belle: I didn’t hear what it was. Beyer: There were two questions, what have the commissions been like? What’s it like dealing with the commission? And secondly, how has it evolved and changed over time? I can give you a couple of pointers and maybe John, you too. The commission often reflects the spirit of the times, and maybe the politics of the times. But it also reflects the chair, even though the chair is appointed by the mayor and who has an influence on him. The chair often creates the environment for the way by which hearings are conducted, how decisions are made, how the term appropriateness—which is a key single word that governs approvals or disapprovals for submissions for landmarks—get interpreted. The trend has for us, and maybe we’re only seeing part of it, has been toward a more sympathetic attitude about contemporary architecture in conjunction with preservation. Q: Do you think it’s a gradual direction that it’s headed? Beyer: Yes. I would say that I could be a general trend, and certainly in the last ten years or more. What I mean is that additions to landmark structures, either vertically or horizontally, or new buildings that are being built next to a landmark that are being judged because they are next to a landmark, because you have to go before the commission to do that, tend to be more acceptable as contemporary architecture than in the past. Q: To what extent do you think that follows from a given chairman having been an architect? There have been several who are. Beyer: Several? Most of them have not been architects. Q: And David [F.M.] Todd. Q: He was briefly there. Then the commissioner who took over right after Jennifer Raab left, who’s name I’m blanking on. Q: Sherida Paulsen. I think those are the three. Beyer: So, you have a very good recall of that, better than mine. The majority has not been but I would say that has not necessarily been my observation, that’s because of them being architects. It could also have to do with the composition of the commissioners. There are commissioners who have been architects who have been very influential. Bill [William] Conklin, for example, was very explicitly in favor of contemporary interpretation of new things. Richard Olcott, who was with Jim [James S.] Polshek currently Fred [Frederick A.] Bland, who we know—are strong advocates of expressing a contrast where it’s appropriate between something new and something old. Q: Can you think of a particular project where this made a difference? Beyer: Sure, for example, the Seaport. Bill Conklin was on the commission at the time. Kent Barwick was the chair. Q: And Bill was the vice chair. Beyer: That’s right. And Elliot Willensky was on, another architect. Q: He was also later vice chair. Beyer: That’s right, you know it all [laughs]. I think that made a big difference and that was not so recent, that goes way back to the ‘80s. That was avant-garde thinking at the time. Now, we see many additions on rooftops that are quite crisply modern—glassy, metallic, on top of a masonry building, behind a cornice. Very much unlike historic additions that are made to look like the base building, the host building. We just finished a beautiful addition to the old courthouse in [Washington] D.C., which John did. It’s a completely modern addition, horizontal addition, lateral addition and it’s very well received. That’s not this commission, but it’s the theory of the idea of contemporary architecture and historic architecture having a life of their own, often. Q: Do you see this as a national trend? Beyer: Yes, I think it is, definitely. You look around the country, and additions to museums, particularly the Boston Museum of Fine Art, you look at Minneapolis—it’s a fair number. For example, at the Met [Metropolitan Museum of Art], Kevin Roche’s work at the Met over a long period of time where his building were, not on the Fifth Avenue side, which were is so prominent, but on the park side, are very contemporary in their total design but very fitting in terms of scale but very contemporary in terms of design and materials. Q: That was very controversial, in its day. Beyer: Absolutely. There’s more to come on that. Q: The New York Landmarks Conservancy, you were on the board and you were president of the Conservancy. Q: Can you tell us something about your experience there? What were some of the major issues you got involved with at the Conservancy? Belle: Where to start? When was its founding, do you know? Q: I think it was either late ‘70s or early ‘80s. Beyer: Yes, I think it’s fairly recent. Belle: Well, I think it was specifically fashioned to attract prominent citizens who may not be qualified as professionals but had potential in greatly influencing the approval of landmark buildings throughout the whole city, but mostly particularly in Manhattan. It’s had a very successful influence in the designation of actual buildings and districts. It’s raised a lot of money, which for the most part has gone to good things. I’m not so sure about living landmarks but that is successful, raising money for. Q: The Landmarks Commission is a city regulatory agency. You‘re private architectural firm; you deal with clients who are private developers. And the Conservancy is the advocacy world. Q: So, what was that like, with you as an architect, working in the real world, leading an advocacy organization that might not have quite the same point of view? Belle: Well, I think it was fine. It certainly didn’t make me feel constrained by that. In fact, I took it as a point of departure to help the business community and private citizens understand the role of landmarking. I think it probably was most frustrating when some of the issues got a little mixed up. Q: Was there a specific area or project where you think Conservancy was influential in making something happen that might not have otherwise? Anything that you were involved with at the Conservancy where you made a difference? Belle: Nothing comes to mind. Q: Would you see it as important as one of the players in the conservation world generally? Belle: I hope so. It should be. Q: What would you say has been the relationship between designers and activists generally? Is that something that’s changed? Beyer: Well, this is an ongoing and predictable situation in New York and elsewhere, all over the country, where you have the proposed project in a community that is approved or will or can be approved, clearly something that somebody wants to do and not infrequently that nobody wants. That’s part of the other side of the table. There are civic groups that are more organized than just neighborhood groups or community residence that are relatively consistently conservative about their evaluating or testifying about a project that is clearly modern or new or different. Invariably do we get much objection about pure preservation or pure renovation because very often you can’t do more than that, or if you do it’s fairly modest. I can tell you the number of projects that we have worked on that represent an as of right addition, just because of zoning permitting or more floor area that the building site may have, the building being either a landmark or not, having the ability to be added to. That gets into the level of controversy that gets fairly consistently objected to. Q: Anything that comes to mind as an example? Beyer: Well a very dramatic example, of course, is Norman [R.] Foster’s proposal for the Park-Bernet [Galleries] on Madison Avenue, across from the Carlyle [Hotel]. Many of us at the time felt that was a bit of an overreach. Q: The project or the opposition? Beyer: The design was an overreach and the opposition was well founded in their attitude and contributed to a very significant coalition of people in the city, as well as the Landmarks Commission, in toning that down significantly. There are many examples of fairly modest design proposals that do get controversial, roof additions particularly. Q: Again, something in particular come to mind? Beyer: Well, we have experienced quite a few ourselves. Here’s a little one that was a fairly modest, a very simple Soho cast-iron building with a very beautiful all cast-iron front on Broadway. We proposed a two-storey addition. Now this was a little different because the community really wasn’t involved with the issue of testifying significantly against it. As a matter of fact, oddly enough the community—which included the Community Board 2—supported it, but the Landmarks Commission couldn’t handle the two-story addition. That’s not quite a direct answer to your question, it’s just an aspect of what happens when you’re dealing with additions to landmarks. Belle: But it’s a good example of the type of interaction that goes on between the board and the community. Beyer: Well, look what happened with—I don’t want to overuse Norman Foster as an example—but look what happened to the New York Public Library. That was not an architectural exterior issue, it was an interior design issue that became extremely volatile with the academic world, with the research world, with people who use the library. It was a very strong, well-planned, well-rehearsed opposition that caused the library to abandon the scheme. Q: Speaking of Foster, his addition to the Hearst Magazine building [Hearst Tower] got built. Beyer: That got built, and we were actually involved with that before he was—way before, maybe five or ten years before—with the same owners but a different administration. Q: What were you planning to do? Beyer: The same thing. Our building was exactly like his but it wasn’t quite—in terms of the shape, the masting and the location. But he was hired later. We actually got it approved through Landmarks as an addition, I have a model of it here somewhere, I could show it to you. His addition, I think is very appropriate and reflects a philosophy we believe in. Beyer: Well, there’s an example where the host building being the base could take a tower from a zoning point of view and from a planning point of view, because look at all the buildings in history that have a classical base in a tower. Look at our Thurgood Marshall Courthouse, for example, or the Boston Customs House. There are many buildings having classical bases and a fairly straightforward tower rising about it, either classical or not, but a very separate combo of functions and forms. For me, Norman’s building at the Hearst site is a very good example of how a modern addition can actually wave its arms and be proud of itself and not try to be deferential because of the nature of the way they come together. I often feel that additions or small modifications to a historic building can sometimes become too aggressive or too glaringly different. Q: Can you think of an example? Beyer: There are a few buildings around town where there are additions to non-landmark buildings but existing buildings—because I don’t think they would have been approved if they were landmark buildings—that have very, kind of—and I can’t exactly remember the name of them, but there are a few in the Meat Market [Meatpacking] District and a few in the Lower East Side that have, to me, have an overly me-me-me-ism about the addition compared to the host building. That’s just a personal point of view. Q: Do we have time for one more set of questions? Beyer: We have nothing but time. This is lovely little event and we’re delighted you have us captured. Q: Architecture and preservation exist in the real estate world. The real estate world has its ups and downs, its booms and its busts. You have seen a bunch of those I would guess. How has that affected historic preservation? Do you see a difference, for instance, in the boom of the 2000s versus the boom of the 1980s? Has it made any difference at all, or is it just a question of bringing projects or not bringing projects because of financial times? Beyer: What do you think of that one? Beyer: Not exactly, but they emanate from the same reasoning, which is conservation of the existing built world, forgetting whether it’s historical or not. There’s a fundamental overriding importance to that point of view, whether it’s landmarked or not, which we believe in significantly and we treat non-landmarks very much like we do landmarks when we’re working with them. If you take that definition, that rides with the economy up and down, but generally people will fix up when they don’t build. That’s one of the reasons I think we’re always so busy. If people aren’t building, they’re fixing up and we’re pretty good at fixing up. We’re pretty good at building too, so that’s why we’re always busy. I don’t think preservation, per se, is much influenced by that. It’s more general, other than what I just said, it’s a more general ebb and flow. Q: You make an interesting point, that your firm does both, you do brand new buildings and historic buildings. Do you see an influence of one on the other? Does your preservation work bring you a certain perspective when you come to design brand new projects? Or are they totally unrelated? Beyer: They’re always related, we never forget it. We’re always thinking of preservation, planning, new construction, always the same way. It’s a fundamental, core belief that everything is all interconnected. Belle: I think that the terrible expression, contextualism is in its best sense a good illustration of how a combination of the two can work together, bringing together the value of two different styles, one existing perhaps more an adaptation of a building, more often than not, bringing an added value to that site, to that place in the city, simply by coexisting together. That’s something that took a long time, the profession to really understand. It was a bonus value that brought to new construction if they did try to take the time and trouble to review and look at the existing fabric on or adjacent to that site. Q: I want to ask you about one specific project, and that’s Ellis Island. You were involved in the restoration of the main building. Ellis Island is one of those places that everybody knows about, it has such a huge role in the history of the country. What were some of the issues that came up that had to be decided? What kinds of questions were you faced with when restoring and working on such a project, with such and iconic place for so many people? Belle: Well, I think the basic issues that had to be reviewed and assessed over time were when is it okay and acceptable to adaptively reuse historic fabric and when was it not? If you had a programmatic use for a part of Ellis Island accepted to be new use then it has to have a fabric that’s compatible with the existing to remaining fabric. Q: The new use being the museum? Belle: Yes. It’s a very good example of how industrial graphic design or designer firm, individual portions often get dangerously close to overwhelming the restoration of the new use of the building. I’ll give you one example. All of the major exhibit rooms on the second floor, which follow the shape of the building, particularly on the east wing. Each one of those rooms has a fairly heavy use of graphic industrial design—the exhibitory [unclear] designed to fit in the historic rooms. I was intent on doing everything we could to save the historic shape of the rooms. To do that, in their eyes, it would be necessary to blank the large windows, which are no longer needed for the exhibit use with heavy fabric of a way in which to darken the rooms. We had to fight very hard to preserve the shape of the room, the use of the room and the nature in which people would circulate through the room rather than circulate around the rooms, [unclear] historic. That was a very tough battle because the designers of that exhibit wanted that space for exhibitory and we wanted to bring it back from the external walls so that it was not dominant of the space immediately inside the windows, which would have changed the whole index. That sort of context is sometimes difficult to do. There’s the project we just finished in Antwerp. Q: The immigration museum there? Belle: The Antwerp museum [Red Star Line Museum]. It’s just been opened and has some significant changes to what were very utilitarian exhibit rooms, which are strongly influenced by the shape of the original rooms. We built a case for reusing a chimney stack of the same height, and the same shape as an observation tower for visitors to that building in a whole new way. There are radical designs often done in the face of replicating a shape but not a function, which is a tough thing to do sometimes. We’ve done it several times and I think it’s been successful. Q: I have kin who have come through Ellis Island and I have family who are in Antwerp. Q: I’ve seen Ellis Island, but I’ve never been to Antwerp but it’s a place I’ve got to go. Beyer: Now you have to go. Q: You’re an immigrant, in the sense that you came from Wales, correct? 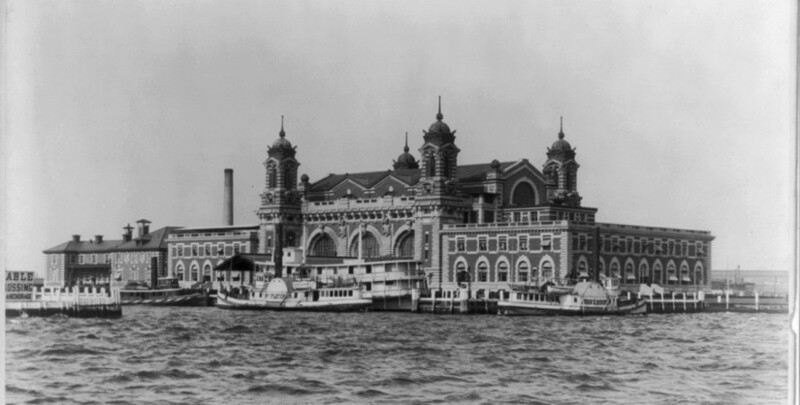 Q: Did that have any impact on your thinking about Ellis Island and its immigrant experience? Or was that not important? Belle: Yes, it did. Mostly its association or connection to immigration across the ocean and how that affected the reception areas at both ends of the journey and also the relatively small size of the project and the limited resources they had. They did a very good job. It’s well worth going to see if you go to Europe. Q: It’s on my list. Did you try to make a connection between the two places? Antwerp and Ellis—because they are connected, Antwerp and Ellis Island? Belle: Yes, we got a historical group really supporting the restoration of the both [unclear]. I think in time it will grow, this whole idea that there is a whole area of architectural significance in certain locations that work very well and make a strong case for those places being built—a higher identity in the whole realm of immigration architecture. A fascinating subject. Q: Do you have a sense of the future of preservation and conservation and rehabilitation? Do you see trends emerging that things may be different in the next twenty years? Does it seem to be on a track that it’s going to be the way it’s been? Beyer: I think the past twenty years have been a huge success story for preservation. I would say the last fifty years, celebrating next year the fiftieth anniversary of the law in 1965. But I think it’s much more come into its own much more recently, in the last twenty years, at least twenty-five years. There’s a lot to it, it’s not just preservation. There is a whole global philosophy about conservation, making use of the resources that we have is a broad, philosophical, agree-to concept for many people and many parts of the world. Preservation has always been needed and it always will be simply because buildings exist and they will be needing things to happen to them—either just the normal curatorial management of them, as Jimmy Fitch would say, or the reinvention of them because of all the things that happen to society and the new needs that universities and people have, institutions for constantly reinventing themselves. We would see this as a never-ending need and opportunity. There are certain fundamental philosophical guidelines one would hope would be retained, but on the other hand I think we are always looking for fresh new ways of reusing old buildings. We’re surprised how often we do it twice. Maybe because it’s that we’re getting on. We have a forty-five-year-old practice, maybe because our successors, many of whom we have in this office, maybe 150 of them, will find a way to keep on re-having not only other people’s building but our own. Belle: I couldn’t endorse it more, what Jack has said. The whole historic step here that is being realized—a monumental understaßnding of our parts and our history and our techniques and technology and building improvement, if you want to call it something else—it never ends. Younger architects than me are beginning to find their own way of doing it, which I take as a compliment. That we, in any way, had an influence on the next generation of architects who need a little inspiration that their shape forms and style of architecture is not necessarily inferior because someone else got there first. That’s just the beginning. Q: Anything else that you may want to comment on? Beyer: We often are asked what’s our favorite project and I’m glad you didn’t [laughing]. Thank you very much it was a delight. Q: Thank you, it was an honor.